Perspective as Spiritually forming? | Transformational thoughts…. Those who read the Bible from a spiritualizing, other worldly perspective will have a spiritualizing, other worldly faith and go to spiritualizing, other worldly churches. Those who read the Bible from a prosperity-promising, greed-promoting, materialistic perspective will have a prosperity-seeking, greed-satisfying faith and go to prosperity-baiting, greed manipulating churches. Those who read the Bible from an individualistic, self-actualizing, autonomous-spirituality perspective will have a privatistic, personally tailored, egocentric faith and go – if they so choose to go – to ego-oriented, individualistic, self-fulfilling churches. Those who read the Bible from a patriotic, nationalistic, “God Bless My Country” perspective will have a security-based, trust in armaments and military as God’s way of making us “the possessors of might and the heirs of what is right” and will go to a church where they and the Christ they follow recognize Caesar’s prior claims to our sons and daughters when we are threatened. Those who read the Bible from an Old Testament prophets perspective, like Micah, Joel, Amos, and Isaiah and from the perspective of the Jesus of the Gospels will have great difficulty reconciling their faith with other-worldly spirituality, materialistic, individual fulfillment, nationalistic, rationalized perspectives and find themselves outside the mainstream of Christianity as dissident disciples and go to a church where discipleship to Christ is valued above spirituality, prosperity, security, or success – or will try fruitlessly to find such a church. David Augsburger, Dissident Discipleship: A Spirituality of Self-Surrender, Love of God, and Love of Neighbor. 133. Sometimes we come to the Bible looking for something. Sometimes we bring our cultural or personal baggage with us, looking for and justifying a particular spirituality that operates within the realm of what we want out of a divine relationship. Those perspectives and hopes bring us dangerously into the realm of idolatry. We end up worshipping the part of ourselves that seeks to quench our anxieties, fulfill our desires or fall softly into the comfortable status quo of culture. Those perspectives, whatever they are, however we bring them to the text, are spirituality formative. The question becomes, do we become formed by a god we create, or Jesus. 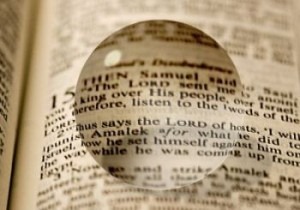 What perspectives do you bring when you read the Bible? Which of the above perspectives do you find in your particular context? This entry was posted in Bible, Christianity, Church, Culture, Dysfunctional, Evangelical, Spirituality, The Enlightenment, The Reformation, Theology. Bookmark the permalink.